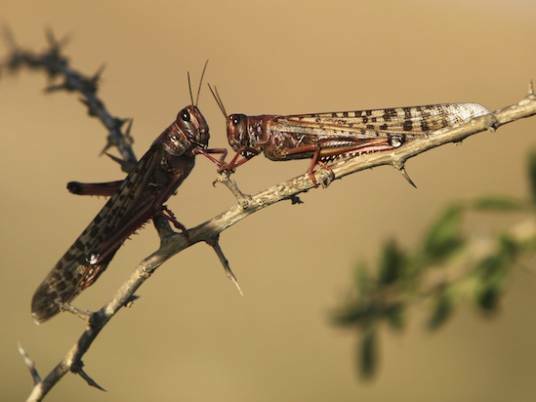 New locust sightings were reported Monday and Tuesday in Qena, Luxor and North Sinai Governorates, prompting authorities to send teams to the affected regions. The Agriculture Ministry Directorate in Arish said pest control operations are currently working to exterminate the new swarms of locusts, which were spotted in Be'r al-Abd and Arish. According to a ministry statement, teams are combatting the insects, which were first reported on 3 March. The Wasat Party’s branch in North Sinai is participating the extermination. Wasat Party leader and volunteer Yehya Hussainy said the organization is coordinating its efforts with the Ministry of Agriculture, several NGOs and residents. In Luxor, three flights were delayed for more than 20 minutes on Monday as locusts descended on the Luxor International Airport. Adel al-Dahhan, the airport director, said the insects had surrounded the airport for an hour, attracting birds. On Tuesday, Dahhan denied rumors that the airport had closed or been affected by major delays. In Qena, the Agriculture Ministry Directorate said the locusts had targeted farms in the area between the communities of Qena and Safaga.